Those in the legal profession fear a possible constitutional crisis if Raus Sharif’s tenure as chief justice is extended. PETALING JAYA: Attorney-General Mohamed Apandi Ali must go public to quell talk of the likelihood that the tenure of Chief Justice Raus Sharif will be extended, lawyers said. They said Apandi, as the chief legal adviser to the executive arm of the government, had a public duty to ensure no constitutional crisis occurred if Raus remained on the bench. However, law expert Abdul Aziz Bari has urged Raus, as head of the judiciary, to openly declare that he will vacate his office in early August to put matters to rest. They were responding to an April 26 report in The Malaysian Insight which quoted a Putrajaya source as saying the tenures of Raus and national police chief Khalid Abu Bakar were expected to be extended up to two years to ensure continuity as Barisan Nasional faces the 14th general election. Yesterday, the Malaysian Bar, which represents the voice of some 18,000 lawyers in the peninsula, joined the chorus of critics protesting the likelihood of the authorities extending the tenure of Raus, who should retire on Aug 3. Bar president George Varughese said it would be unconstitutional to extend Raus’ term beyond the prescribed age limit. He said provisions in the Federal Constitution gave rise to the conclusion that a Federal Court judge, who includes the chief justice, could not remain in office after 66 years and six months in age. Varughese said there was also no provision for Raus to remain as top judge by being appointed “additional judge”. “The chief justice and any additional judge must be two distinct persons,” he had said. Varughese said Raus’ contributions to the judiciary were well known and it would be unfair to him should he be embroiled in any form of controversy at the pinnacle of his illustrious career. Last week, retired Federal Court judge Gopal Sri Ram also said any extension given to Raus would be unconstitutional and could be subject to legal challenge. Criticism of any move to retain Raus as top judge also came from former de facto law minister Zaid Ibrahim and former Bar president Param Cumaraswamy. Raus was appointed chief justice during his six-month extension which will expire on Aug 3. 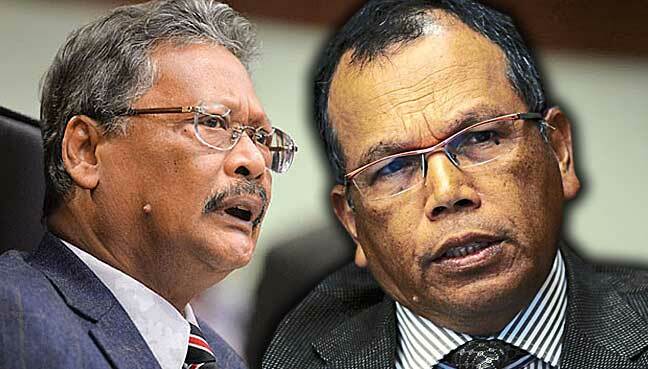 Lawyer S N Nair said it was imperative for Apandi, as the AG, to clarify the legality and validity of such an exercise. He said under the law, appointments of judges of the superior courts and Judicial Appointments Commission members involved the prime minister. “Due to overwhelming objections to the possible extension of the chief justice, the public have the right to know,” he said. Nair said the people had the right to an explanation because salary and other perks for judges also came from the public purse. Lawyer Mohamed Haniff Khatri Abdulla said whether Apandi had given his advice to Prime Minister Najib Razak, as head of the executive branch of the government, must be made known to all. He said judges, including those holding administrative positions in the judiciary, were constitutional appointees. “Both the prime minister and AG must be transparent because they have pledged to preserve, protect and defend the constitution when both took their oath of office,” he said. He said one could infer that the April 26 news report about the possible extension was true as the government had not denied it. “There could be a full blown constitutional crisis after Aug 3 if the chief justice implemented judicial and administrative functions,” he said. Haniff said silence was no longer an option for the AG as he must reveal whether such extension was constitutional or otherwise. Meanwhile, Aziz said Raus should come out to explain whether he would remain in office beyond early August if he “cared for the nation and the judiciary as the third independent branch of the government”. “Raus, too, had taken his judicial oath that he would be subservient to the constitution when he was appointed the nation’s top judge,” he said. He said any extension to Raus’ tenure could also be interpreted that the current set of judges were incapable of steering the bench to greater heights. He said it would also be construed that the judiciary was at the mercy and under the influence of the executive. Meanwhile, Apandi has yet to respond to an FMT query through WhatsApp sent to him a week ago.